Union Defence Minister Mrs Nirmala Sitharaman, arrived at Tezpur on 08 Oct 2017 as part of her maiden visit to the Eastern Command as Defence Minister. She reviewed the operational preparedness in Northeast. The minister who was accompanied by, Lt Gen Sarath Chand, Vice Chief of the Army Staff and Lt Gen Abhay Krishna GOC- in- C Eastern Command was received at Tezpur Air force Station by Lt Gen AS Bedi, GOC Gajraj Corps and other senior dignitaries of the Army and the Air Force. The visit which is part of her familiarisation with all the formations of the Indian Army & the Indian Air Force (IAF) comes close on the heels of her visit to Northern Command recently and her visit to Sikkim yesterday. At the outset, the Raksha Mantri extended her good wishes to the Air Warriors on the occasion of 85th Air Force Day anniversary as she interacted with them at the strategically important Eastern airbase of Tezpur. 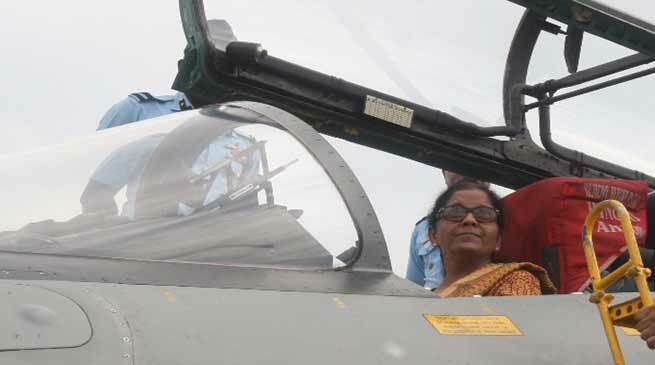 She also reviewed the operational readiness of the airbase, seeing the Sukhoi fighter aircraft & other IAF assets at first-hand. Thereafter, the Raksha Mantri visited the Gajraj Corps HQ where she was briefed by Lt Gen AS Bedi, GOC Gajraj Corps on the overall security situation in Assam and the Kameng Sector of Arunachal Pradesh and the operational preparedness of the Corps. The Raksha Mantri subsequently visited Solmara Military Station, Tezpur where she interacted with the officers & jawans over a cup of tea. She appreciated the high standards of military discipline and preparedness of the army men and women and their excellent performance in the difficult terrain and challenging environment in which they are operating.